President Donald Trump said Wednesday the government would "spare no resources or expense" in protecting "the safety of the American people" in response to reports of apparent explosive devices being mailed, delivered and addressed to various prominent Democrats at government buildings, personal residences and media outlets in New York, Washington and Florida. "We will spare no resources or expense in this effort. I just want to tell you in these times, we have to unify, we have to come together and send one very clear, strong, unmistakable message that acts or threats of political violence of any kind have no place in the United States of America," Trump said in remarks in the White House Wednesday afternoon. Later, the bomb threats were front-and-center at a Trump rally in Wisconsin, where the crowd was still jeering former Trump presidential opponent Hillary Clinton and the press. House Speaker Paul Ryan and Wisconsin Gov. Scott Walker both addressed the attempted attacks at the event, with Ryan calling them an "act of terrorism" that has no place in our democracy. But other speakers still singled out former President Barack Obama and the press in their remarks, prompting boos. The crowd also erupted at one point into a familiar "Lock her up!" chant directed at Clinton, Trump's 2016 rival. When Trump took the stage, he echoed his earlier remarks about holding those responsible "to justice" and calling for unity. "We want all sides to come together in peace and harmony," he said. Then, without naming a party, he pivoted to condemning Democrats. Americans “should stop treating political opponents as morally defective,” not “compare political opponents to historical villains” and “not mob people in public," he said. It was clear that Democrats, whom he later lambasted in policy terms, were his target, NBC News reported. Thursday morning, Trump again put blame on the "Mainstream Media" and wrote on Twitter that it "must clean up its act, FAST!" "A very big part of the Anger we see today in our society is caused by the purposely false and inaccurate reporting of the Mainstream Media that I refer to as Fake News. It has gotten so bad and hateful that it is beyond description," the president said. 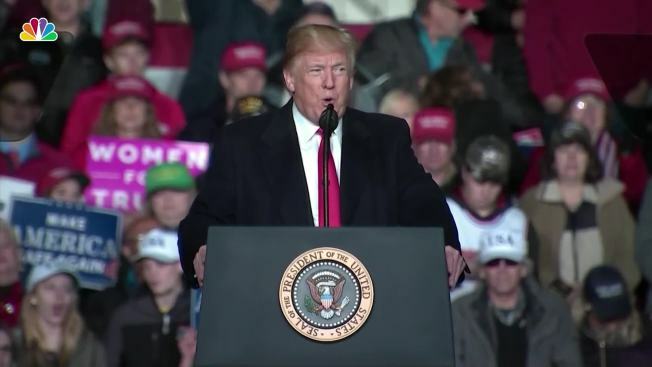 Trump has frequently used his political rallies as an opportunity to launch rhetorical attacks on his political rivals and on news media — including Clinton, Obama and CNN, who were all targeted by the senders of the explosives. Some have called him out for using his language to incite, directly or indirectly, acts of violence by his supporters against his opposition. CNN President Jeff Zucker released a statement accusing the White House of "a total and complete lack of understanding...about the seriousness of their continued attacks on the media." "The President, and especially the White House Press Secretary, should understand their words matter. Thus far, they have no comprehension of that," he said. Outgoing Republican Sen. Jeff Flake of Arizona has been one of the rare GOP lawmakers to speak critically of the president. He told MSNBC Wednesday that if crowds at his rallies start in with the familiar anti-Hillary Clinton chants of "Lock her up," Trump should stop them. If Trump "doesn’t say 'hey that’s inappropriate, don’t do that,' or if he is talking about a journalist that's been beat up and that's okay, I mean, that's wrong," Flake said, also referencing Trump's endorsement of GOP Rep. Greg Gianforte's body-slamming of a Guardian reporter, for which the Montana congressman was charged and pleaded guilty. Flake said Trump "needs to follow up what he said with actions. And if he models that kind of behavior, it helps the rest of the politicians as well." Flake said the president's initial statement Wednesday on the explosive devices, in which he called for unity, was "great." White House press secretary Sarah Huckabee Sanders defended Trump on Thursday, saying the notion that he is responsible for the packages being sent is "disgraceful." She told reporters there's a big difference between "comments made and actions taken." Sanders said the president is not responsible for sending suspicious packages any more than Democratic Sen. Bernie Sanders, an Independent from Vermont, was responsible for one of his supporters shooting up a GOP baseball practice last year in Virginia. The gunman, James Hodgkinson, had posted social media messages suggesting he targeted the team because of his political views. The packages that appeared to be targeting Clinton, Obama, CNN's New York offices, billionaire philanthropist George Soros, Eric Holder and Debbie Wasserman-Schultz, were sent to various locations this week, appeared to contain live explosive devices and appear to be linked, law enforcement sources told NBC New York. Earlier Wednesday, political figures from both major parties took to social media to condemn politically driven violence. At a campaign rally for a congressional candidate in Scranton, Pennsylvania, Vice President Mike Pence condemned the attempted mail bombings. “These cowardly acts are despicable and have no place in American society,” Pence said. Trump also retweeted a tweet by Pence where the vice president thanked law enforcement members for their fast response. "I whole heartedly agree!" Trump wrote. House Minority Leader Nancy Pelosi also commended the "heroism of America’s first responders" and urged for unity in the face if terrorism in a Wednesday afternoon tweet. "The goal of terrorists is to instill fear," Pelosi added in the tweet. "We will not allow them to diminish our commitment to building a brighter future for communities across America." Packages addressed to Clinton's home in a New York City suburb and Obama's in Washington, D.C., were intercepted during mail checks. Authorities said the Clintons and Obamas were not at risk of receiving the packages. At a campaign event in Coral Gables, Florida, Wednesday afternoon, Hillary Clinton thanked the people who stopped the packaging from reaching her Chappaqua home. 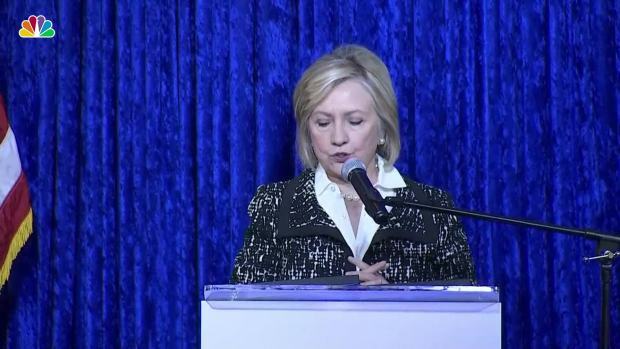 "We are fine, thanks to the men and women of the Secret Service who intercepted the package addressed to us long before it made its way to our home," Clinton said. "But it is a troubling time, isn’t it, and it’s a time of deep divisions, and we have to do everything we can to bring out country together." Another package sent to CNN offices at Time Warner Center in New York City was addressed to former CIA Director John Brennan, who is now an analyst for MSNBC. The package got as far as the mailroom before CNN employees were evacuated. On Twitter, Brennan criticized the president's reaction to the incidents, writing, "Stop blaming others. Look in the mirror. Your inflammatory rhetoric, insults, lies, & encouragement of physical violence are disgraceful. Clean up your act....try to act Presidential. The American people deserve much better. BTW, your critics will not be intimidated into silence." Another package that was addressed to former Attorney General Eric Holder had the wrong address and was sent to the Florida office of ex-Democratic National Committee chairman Rep. Debbie Wasserman Schultz, D-Fla., which was the return address listed, NBC News reported. Later, Congressional leadership sources confirmed to NBC News that a suspicious device intercepted at a mail processing facility for the U.S. Capitol was addressed to California Rep. Maxine Waters. That device's nature, and possible connection to the others, was not immediately clear. "I have been informed by U.S. Capitol Police that my Washington, DC office was the target of a suspicious package that has been referred to the FBI," Waters said in a statement. "I am appreciative of the law enforcement entities who intercepted the package and are investigating this matter. I unequivocally condemn any and all acts of violence and terror." "Those behind such reprehensible acts must be brought to justice," Rep. Paul Ryan said. "We cannot tolerate any attempt to terrorize public figures." The comment came after Cruz joked Tuesday night during a campaign event that his political opponent running for U.S. Senate, Beto O’Rourke, should be in jail with Hillary Clinton. House Majority Whip Steve Scalise, R-La., called the devices acts of terror. Last June, Scalise was among four people shot at the Annual Congressional Baseball Hearing for Charity by a man who specifically targeted Republicans out of hatred for President Donald Trump. Once again, we are reminded of the heroism of America’s first responders as they work to counter these attempted attacks. The goal of terrorists is to instill fear. We will not allow them to diminish our commitment to building a brighter future for communities across America. Those responsible for these evil acts of terror must be hunted down and brought to justice, and I have great confidence that our law enforcement officers will succeed in that mission. As a nation, we must agree that this is a dangerous path and it cannot become the new normal. These acts of attempted murder—in effect, terrorist attacks—must be denounced & deterred. Prosecution & punishment must hold the perpetrators accountable. Throw the book at whoever made these bombs. Attempting violence against public officials, private citizens, journalists, or anyone has no place in our free and lawful society. Attacks and threats against anyone, Democrat or Republican, are not okay. We must find those responsible and prosecute them to the fullest extent of the law. First lady Melania Trump, who spoke directly before the president at the White House for a press conference on the opioid crisis, said she "strongly condemn[s] all who choose violence." "We cannot tolerate those cowardly attacks," Mrs. Trump said. "I'm grateful to the Secret Service as well as the local and federal law enforcement for all they do on a daily basis to keep us safe and encourage people across the country which is kindness over hatred." New York Gov. Andrew Cuomo also said his Manhattan office received a suspicious package, though law enforcement later determined was not at all linked to the others. A senior law enforcement official told NBC New York the item was a threatening letter, not a device, that referenced the Proud Boys street brawl from earlier this month. There was no explosive, the official said.